A brad nailer is handheld power device that you use to drive brad nails into wood. Many people tend to confuse it to a finish nailer, but the brad nailer is smaller. Due to this, you can use it to attach small molding and trim to your woodworking project. Are you looking for the best electric brad nailer? Continue reading. The nailer uses brads which are special types of nails made from 18-gauge wire. The brads feature a fragile head that leaves a smaller nail hole after you have sunk it into the wood surface. Since you make a tiny hole, you need little wood filler to finish the piece. In most cases, you don’t even need to fill the hole. 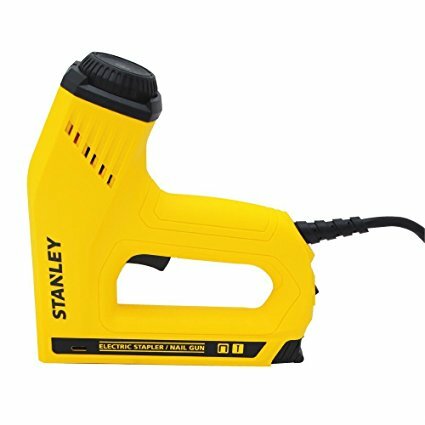 This electric staple delivers convenience, versatility, and efficiency on the table. The first impressions have a great impact on whether you buy a tool or not. The electric bran nailer is made from plastic, but the construction is sturdy and ergonomic. When it comes to the shape, the staple gun has a pretty shape, and you can comfortably rest your arm on top of it without getting fatigued. Since no two pieces of wood are the same, this brad nailer allows you to adjust the amount of power that you use on a given wood. If you are working on a soft piece of wood, you should choose the Lo mode. On the other hand, if you are working on dense and hard planks, you should choose the Hi mode. 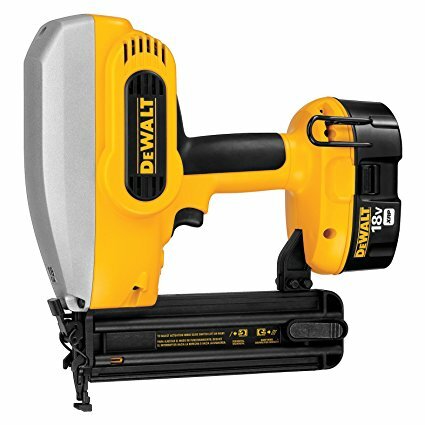 The device has an outstanding driving power that allows you to even use it as a nail gun. This feature is essential when you have to work with sturdy materials such as hardwood. The feature allows you to drive nails into thick walls and decking easily. The feature also saves you money as you don’t need two tools—one to drive nails and the other to staple them in place. The TRE550Z can do both becoming a valuable part of your toolbox. In addition to the device having the above features, it has many others. For example, it has the quick-jam clear feature that allows you to reload it when you have nailed all the nails easily. You don’t have to worry about jamming the machine as that is taken care of. After loading the machine, you only need to start and continue with your work. There are many things to like about the brad nailer. One of the things that we truly loved is the simplistic and ergonomic design. The simple design makes it possible for almost anyone to use it. You don’t have to be a skilled handyman to use it. We also liked the design of the trigger. Unlike other pieces that are highly sensitive, the trigger on TRE550 is perfectly made thus you don’t have to worry about releasing a nail without your knowledge. Just like the two sides of a coin, there are a number of things we didn’t like. One is the material used in making the brad nailer. From experience, although, not exclusive, most of the best performing brad nailers are made from metal. This brad nailer is made of plastic. As you know, plastic tends to wear out fast without time. We wish that the device had more parts made from metal. While this is the case, you shouldn’t think that this device will come apart soon. The plastic used in making it is heavy duty, and you should expect it to last for long. Another thing we had issues with was the length of the electric cord. The cord is only 8 feet long. 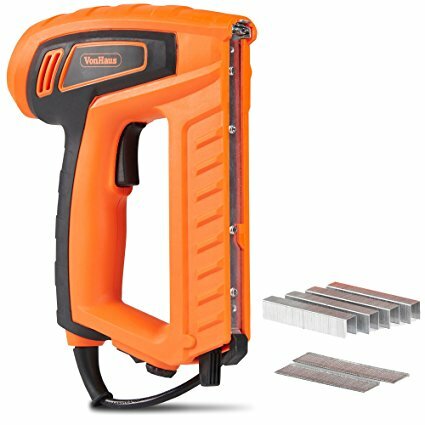 We have come across many cheaper brad nailers with longer cords. While it’s not all that short, we wished it was longer. The cool thing is that you can fix the issue with an extension cord that you can easily buy from your local store. This is your to-go tool for your small projects such as furniture building adventures and trim work projects. The device has plenty of features that make it an ideal addition to your toolbox. The device has an engine design that allows it to work as fast as possible so that you can complete your project in the shortest time possible. Since this machine isn’t meant for the skilled handyman, it has plenty of control features that make it easy to use. The device has both the sequential operation mode that comes in handy when you are looking for precise nail placement and the fast acting bump operation mode that makes it possible for the device to shoot a nail every time that nose is pushed against a material while the trigger is depressed. For the device to make it easy for you to switch between the modes, the machine has a simple switch in front of the trigger that makes it possible for you. When you aren’t using the device, there is the contact trip lock-off that disables the trigger when you are using the unit. When you are ready to shoot a nail, the brad nailer has LED lights that illuminate the work area. This feature comes in handy when you are working in closets and tight spaces. The main issue with brad nailers is jamming. The device has a straight box style magazine that is easy to open and load with your nails. In the event the machine jams, there is a quick access latch on the nose that allows you to reach at the jammed area and fix the problem easily. The cool thing is that you don’t have to use screwdrivers or tool wrenches to unjam the device. What we liked is that the device has a sturdy construction thus you don’t have to worry about going to the store any time soon. As long as you are taking good care of it, it will last for long. We also liked that the device is very powerful and fast. During our testing, we shot over 200 nails within a few minutes which was impressive. Unlike other brad nailers that we have used before, this one has minimal jams. We drove over 3000 nails to experience our first jam which was easy to get rid of. The battery only power feature is great, and it can last you up to 8 hours. If you will be working for longer periods, you should have other batteries charging so that you don’t stop working. There are a number of things we didn’t like about the device. The first one is that the head is a little bulbous which makes the device a challenge to use in tight areas. We noticed that when you fire the nails at oblique angles, the nails tend to glance off the wood, which is very dangerous if you aren’t wearing safety glasses. We also noticed that the driver head leaves a range nail deformation in the wood. Sometimes it might leave a small round depression, while in other times it might leave larger, rectangular depressions. While this might not seem as a big deal to many people, it might be an issue when you are looking for uniformity in your work. Finally, the electric brad nailer doesn’t have a feature that lets you know when there are nails. The only way to know about it is to look through a small window. The most attractive feature of the brad nailer is the 3 in 1 feature. The feature means that the tool can use staples, brad nails, and pin nails. Due to this feature, you can use the tool in wide range applications. You can use it to remodel your fence or even install laminate. The brad nailer has a simple design that is sturdy and durable. Although, most of the parts are made from PVC, the unit is tough thus you can have peace of mind that it won’t come apart soon. In addition to the simple design, it has an ergonomic shape that allows it to fit perfectly in your hands. As a result, you don’t experience any troubles when working. It has a cushioned grip handle that makes the work even easier. Many handymen have reported accidents where they leave their electric power tools only to touch them one time and injure themselves. When you buy this brad nailer, you don’t have to worry about that. Once you are done with your work, you only need to turn the safety switch ON, and you are done. This feature not only protects you, it also protects the children that might be having in the house. 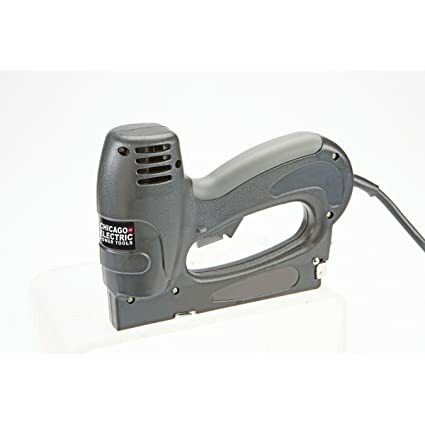 If you have used other electric brad nailers before, you will agree with me that most of them have issues when it comes to the loading and reloading of the supplies. Some of them jam too often while others have complex spring systems that function frequently. This brad nailer has a technology that features an excellent reloading system. All you need to do is to unhook the loading chamber, insert the supplies, and go on with your tasks. This process takes seconds; thus you don’t stall your project. There are a number of things we liked about the brad nailer. One of them is the versatility. Since it’s a 3 in 1 unit, you can use it to cover a wide range of tasks around the house. You also don’t have to stall your project because you don’t have specific types of nails. For example, if the staples get depleted, you can easily switch to brads and go on with your project. You only need to ensure that the new nails will provide you with the results that you are interested in. The brad nailer is also affordable compared to other similar products on the market. Although, it’s made from both metal and PVC, it has a lot of plastic which makes it feel as if it’s made from only plastic. Another thing is that it’s not very powerful when you are working with brad nails. The unit is very powerful when you are using staples, but when it comes to nails, it’s highly inefficient. Due to this, if you are having a project that involves penetrating dense wood or any other heavy duty project, we would suggest that you stay clear of this model. The first thing you will notice about this brad nailer is its unique design which is futuristic. 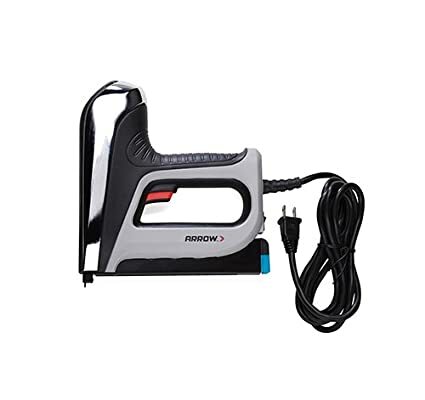 In addition to the unique design, the electric brad nailer is also ergonomic, slip-free, and durable. Unlike other brad nailers in the market that have a solenoid motor, this unit works on a patented technology that ensures that the unit has a lot of power. Since you will not only be driving brad nails in your projects, you need a tool that can also drive staples and this is what this brad nailer does. In addition to nails, you can also use it to drive stapes of different sizes. If you have been using brad nailers before you will agree with me that most them have issues with loading. This tool makes your work easy as it has a smooth magazine release that allows you to load your nails or staples easily. Unlike other machines that require you to check to tell whether the brad nails are exhausted, this one has an indicator light that alerts you. This not only saves you time, it also prevents you from damaging the wood. In addition to the beautiful design, we also liked the sheer power of the brad nailer. We also liked the integrated LED work light that focused the light at the desired work area. This not only allows you to work in dark corners, it also allows you to work at night. Finally, the brad nailer is very affordable; therefore, even if you are operating on a tight budget, you can afford this one. The first thing we didn’t like is that the brad nailer tends to jam too often. The cool thing is that it has a quick release magazine feature that makes it easy for you to unjam it. We also noticed that the trigger is overly sensitive. Sometimes it could fire even when you aren’t aiming at the wood. This is risky as you can easily hurt yourself. This tool comes in handy when you are handling light duty decorating and construction projects. The brad nailer has a simple design. From its look, you can tell that it’s not designed for heavy-duty tasks. Although, the device has a simple design, it’s very comfortable to use. In fact, it has a soft grip handle that allows you to be as comfortable as possible, thus minimizing the chances of fatigue. There are plenty of light duty tasks that you can do using this tool. To make it possible for you, the unit fits a wide range of staples and nails. You can use staples that range from 8mm to 16 mm in the machine. If you want to use brad nails, you can use nails between the sizes of 15 mm and 16 mm. Many handymen complain when they have to refill their machines now and then. To ensure that this doesn’t happen, this brad nailer has the capability of taking up to 100 staples and 80 nails. Due to this, you don’t have to undertake frequent refilling. The last thing you want when working is a device that keeps on stopping. When you buy this device, you don’t have to worry about that as it has an anti-jam mechanism that prevents the nails from jamming thus you don’t stop working. The feature also prevents delays when you are working thus you complete your work within the shortest time possible. The first thing that we liked is the beautiful design that is not appealing to look at, but also very comfortable. Due to the comfort, you can work for a long time. The device also has a low recoil level feature that you won’t find in many electric brad nailers. Due to the feature, you have smooth, controllable nailing which ensures that you have an easy time doing it. To prevent accidents, the brad nailer has a contact safety switch that turns on only when you are in contact with the material that you are looking to nail. While the electric brad nailer is designed for light duty work, it has a lot of plastic parts. I wish it had more metal parts to make it more durable. Since the nail is small, it gets deeper into the wooden surface which helps you to get a better connection between the main frame and the delicate trims and moldings. Due to the better connection, your project lasts for a long time. The small size of the nails also leaves your project looking tidier and cleaner. This saves you time and money that you would have spent to finish the surface. If you are like most homeowners, you try to use the tool that you can easily get your hands on to achieve your intended purpose. Some of the homeowners will try to drive the small nails through small spaces. When using the brad nailer, you don’t have to jeopardize your tools by jamming them into tight spaces. When you need to drive nails through angles, you only need to use an angled brad nailer. When you need to rupture the wood surface, but you need to pay attention to the size of the rupture: Since the brads are small, you will be able to achieve your goal. In fact, you won’t be able to see them when you are two or three feet away. When you need to connect delicate pieces of trim to the mainframe: Delicate trims are fragile and usually difficult to maneuver with. The brad nailer will help you in connecting them without putting them at the risk of getting damaged. You also need to use the tool when you need to attach small moldings. If you have worked with the moldings, you will agree with me that they are annoying to handle. The electric brad nailer also comes in handy when you are looking to undertake some experiments. If you are looking to test which nail or piece of wood that gives you the best results, the brad nailer will help you in arriving at the best decision. Compared to other woodworking nailers, brad nailers are considered the safest to use. This is because the nailers have a simple construction and the nails used are usually very small to use. While this is the case, you shouldn’t be careless in your working as the small nails can puncture your skin causing heavy bleeding and even exposing your skin to infections. The first thing you should do when using the nailer is to ensure that you have the necessary protective gear. Since you will be dealing with wood, there is always the risk of small splinters or sawdust getting into your eyes and even into your respiratory system. You should protect yourself from these elements by wearing a mask and goggles. When it comes to the dress, you should avoid loose clothing as the garments can easily get stuck within the machine putting you at the risk of hurting yourself. Sometimes the units tend to make loud noises. You should protect yourself by wearing the right hearing protection. Before you start using the tool, you should lubricate all the moving parts. This not only protects it from rusting, but it also ensures that it drives the nails properly. You should cover the connector with Teflon tape. This is to strengthen the connection which minimizes the risk of damage or breakage. Once everything is in place, you should go ahead and insert the brads into the tool. You should be cautious when placing the pieces. When you place them too close to the end or edge of the board, you can easily split the material thus putting your project to halt. The type of wood that you are using has a great impact on how you calibrate the brad nailer. Before you start nailing, you should confirm the type of wood and even try the nailer on a similar wood to verify that it will work properly. You should avoid wood knots at all costs. They usually form a tricky barrier for the brad which puts the nails at the risk of breaking. Before you go ahead with your project, check the structure of the wood. Just like with other projects, it’s common for you to have crooked brads and wrong insertions. For you to have an easy time removing them, you should have some removal tools in place. Handling home improvement projects: Whether you are looking to secure trim pieces or replace the crown molding, you can use the brad nailer to do it. You can use the nailer to turn a lackadaisical space to a marvel by undertaking simple fixes. When using the tool, ensure that you use the necessary skills to operate it so that it doesn’t hurt you or damage the material that you are working with. Handling professional tasks: If you are a professional woodworker, you can use the brad nailer to hold things together. Using the brad nailer and special adhesives you can make cabinets, chairs, and other pieces of furniture. The cool thing is that you don’t need to be highly experienced for you to use the brad nailer to create these products. Crafts: Did you know that you can use the nailer to complete small-scale projects and crafts around your office, home, and even your classroom? For example, you can piece together a picture frame using a few pieces of wood. You can also use the nailer to fix a picture that has been damaged. If you have small children and you want to create models for them, you can use the nailer to do so. We can say that as long as you have the skills, the possibilities are endless on the things that you can make using the brad nailer. Use it at the construction site: When you visit any construction site, you will find men and women using their brad nailers to secure parts of buildings and other structures. If you work at the sites, you can use the brad nailer to nail things together around the corners and blind spots. You are not only able to achieve your work easier, you are also able to do it much safer. Doing odd jobs: Here you use the tool to do all types of works ranging from building fences to interlocking flooring projects. As long as you want to piece something together, you can use the brad nailer to do it. As mentioned above, one of the reasons why people go for the electric brad nailer is because it’s easy to use. Before you use the nailer, you should inspect it for any issues it might be having. You should ensure that the nailer doesn’t have any operational defects or safety issues. You should take your time to look for cracks and loosened fasteners on the tip, handle, and even on the body. If there are any issues, you should take it to a professional and have it fixed. Avoid using it in its damaged condition as you risk hurting yourself and even damaging the material that you are working with. You should confirm whether the battery is charged. If it isn’t, you need to charge it or insert a new battery. Once you are done, you should test the electric brad nailer on a solid piece of scrap lumber. The purpose of doing this is to ensure that the machine is working properly. If it is, it should easily penetrate the piece of wood. If it doesn’t, you should consider adjusting the depth screw that you find at the tip. Adjusting the screw should make the machine work properly, but if it doesn’t, you should know that you have a malfunctioning machine that you need take to a brad nailer technician to give it a look. If it’s in good working condition, you should go ahead and use it. When using it, exercise caution that you don’t hurt yourself. When holding the machine, hold it with a firm grip. You should keep your hands out of the way when nailing to reduce the chances of injuring yourself. When joining two pieces of material together, you should take care of how you squeeze the trigger. Before you move, you should ensure that the brad nail has penetrated the object. The best way of going about it is to count to two before you continue with your work. You need the light attachment when you are looking to adjust the grip on the work tool. All you need to do is to secure the light attachment to the nailer, and you will be able to see when hitting the intended mark. When you are buying the light attachment, you should go for one that throws the poll of light on a specific surface. It should throw the light directly in front of where you had aimed the nailer. The cool thing is that the LED lighting attachments are affordable and you can easily get them at your local store. In addition to the lighting attachment, you might also need other accessories. You might need handgrips for your brad nailer, magazine extensions, and many other tools and technologies. When you are buying any accessory, you should ensure that its adding functionality to the brad nailer—not flair and style. While you are at it, you should remember to buy high-quality brads for your machine. The last thing you want are poor quality pieces that will keep on bending or even damage your wood when working. What are you going to use the brad nailer for? This is the first thing that you should think about when you are thinking of buying a brad nailer. When you know how you want to use the appliance you can buy a unit that has all the features that you need in your work. You should note that different brad nailers are designed for different projects. For example, there are those that are designed for upholstery projects and others for general DIY projects. If you aren’t sure of the right one that you should go for, there is plenty of information online, and offline that will guide you. Brad nailers are designed to use a wide range of power plants. There are pneumatic systems that you will find in construction sites that are used in shooting brads into construction material. There are also gas and electronic powered nail guns that you can go for. Your choice should be influenced by your preferences and what you are looking to get from the appliance. While this is the case, you should go for a pneumatic nailing gun if you have other pneumatic nailers that you can use on a regular basis. This is because you won’t have to buy specific fuel cells or batteries to run your brad nailer. You should go for gas or electric brad nailers when you are looking for modern and easy to carry nailing guns. When you buy these machines, you don’t have to worry about hoses as you don’t need to undertake air compression. All you need to start nailing is load the nailers with a fuel cell or a fresh battery, and you are good to go. Different brad nailers have different features. Some have special features such as aiming systems, tracking capabilities, laser levels, built-in lighting system and many others. It’s up to you to choose the one that is ideal for you. When buying the pieces, you should note that the more the features it has, the more expensive it will be. As rule of thumb, don’t buy a unit if you don’t require the features that it has. This is what you need to know about the best electric brad nailers and how to buy the right ones. After buying the devices, you need to take good care of them. This calls for you to regularly inspect them for any faults and fix them as soon as they come about. Thanks for sharing wonderful list.